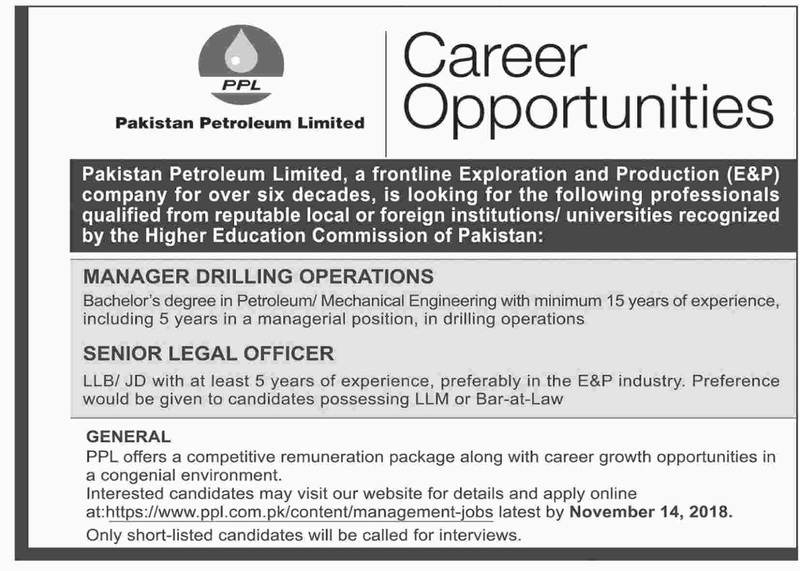 Pakistan Petroleum Limited (PPL) Karachi Sindh. Qualification & Experience: Bachelor's degree in Petroleum/ Mechanical Engineering with minimum 15 years of experience, including 5 years in a managerial position, in drilling operations. Qualification & Experience: LLB/ JD with at least 5 years of experience, preferably in the E&P industry. Preference would be given to candidates possessing LLM or Bar-at-Law. Interested candidates may visit our website for details and apply online at www.ppl.com.pk, latest by November 14, 2018. Only short-listed candidates will be called for interviews.